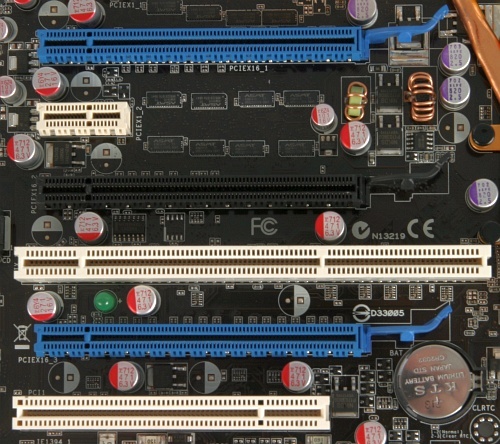 Review: Our second nForce 650i SLI motherboard in our lab. Our second nForce 650i SLI motherboard in our labs. We will see how it will do compared to the MSI P6N-SLI Platinum. 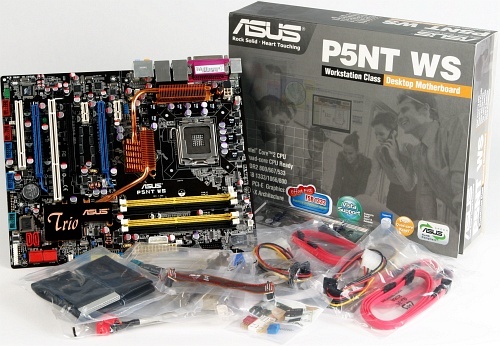 ASUS P5NT WS is of course an "all-solid" design, which was expected at an €200,- price target. 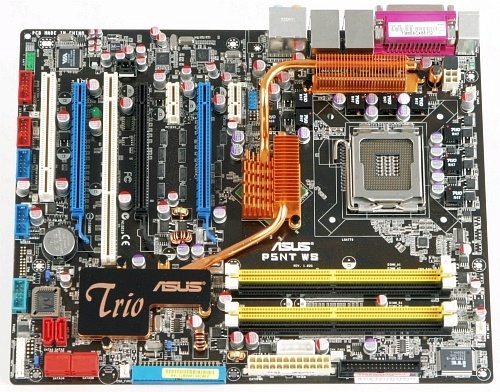 Instead of using the 430MCP, ASUS decided to use the older nForce 570i SLI chipset. The only benefit compared to similar boards is SLI in x16 mode for both cards. Of course the 570i SLI is more power-hungry. The power-voltage-regulator is a 8-phase analogue part, we would have wished for an digital VRM. The power-connector is positioned under the memory slots. 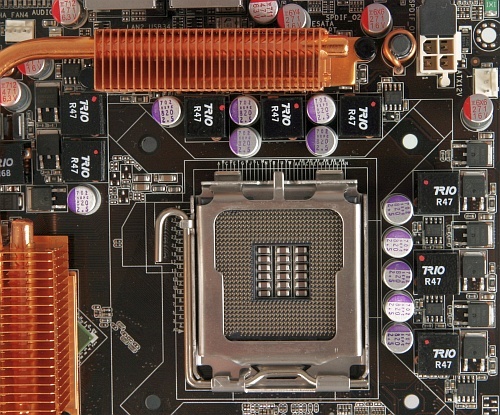 The 8-pin CPU-power connector is well placed on the outer edge next to the cpu socket. The CPU area is clear, mounting big coolers is easy. The colour-scheme is quite pleasing, black PCB on the front, dark-blue PCB on the back. Dual Channel memory is easy identified with the yellow and black memory slots. nForce 570i SLI supports six SATA II ports and one IDE. An extra SATA port is provided by the Silicon Image controller, but for eSATA only. Four of the SATA ports and the IDE port are angeled 90°, this should help with the cable mess. 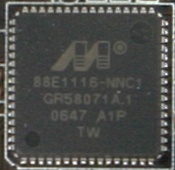 Network connectivity is provided by two Marvell 88E1116 PHY, each MAC of the chipsets are utilized. 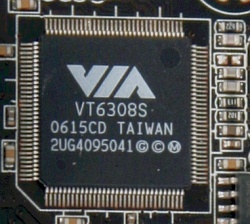 Additional a VIA VT6308S firewire controller is integrated. 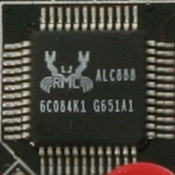 Very odd for an ASUS highend board, this one comes with an Realtek ALC888 instead of an Analog Devices ADI1988B. The panel-connectors are not colour-coded, but ASUS provides Q-connectors. You can assemble all cables to the Q-connectors and put them later into the board. While other SLI boards needs a PCIe switch card, ASUs does not, because it has two chipsets, means that the x16 from 650i and 570i do the SLI without any performance loses. nVidia is using Hypertransport to connect its chipset and of course any board manufacture can combine any chipset with Hypertransport they want. The configuration of the slots is not perfect, using a SLI configuration you will loose the only PCI slot. The heatpipe-construction can barely keep the temperature of the 650i SLI low. It also covers only three of the eight phases. ASUS did use heat-pads instead of a better thermal compound. There is no chipset fan inclucded, so good case-cooling is paramount. We didn't bother with synthetic benchmarks, because they won't tell you anything interesting, we concentrate on real world applications, especially multimedia encoding. Everest will report above 9300MB/s and SiSoft above 7200MB/s when benching memory-read, nobody has explained yet, while there are differences in the results. For our Gordian Knot testing we took an PAL epsiode from "Babylon 5" with a length of 41 minutes, 57 seconds and 8 frames. 1st: We have a perfect master, so we only de-interlace the content and resize it, without any other manupulations, we marked this as "fast". 2nd: You get bad mastering on many DVDs, especially "old" stuff or when the studios are in a hurry for the release. In this case you like to improve the picture quality, which is done by filtering the content. You can choose from tons of filters for any purposes you can think of, we only used the most common "undot", "FluxSmooth" and "MSharpen". Of course we also de-interlaced, filters were done before any resizing took place (which is slower). We marked this as "slow". If you need more infos about filters, we recommand reading the doom9.org forum. The same episode we encoded, we used for our MP3-testing. We don't recommand using MP3 for encoding, because AC3 can do the job better, but nearly 42 minutes gives us approximately the length of any given album. A measurement in seconds, as many sites do, is useless, because the differences are too small. So we used the built-in play/CPU ratio, this means the CPU is encoding x-times faster then the track-length. Fast memory does not play an important role here. For your convenience we show you also the single-threaded benches, they will be produced with any other L.A.M.E. version, because only lameMT can do more than one thread and take advantage of a second dice. Using the ASUS P5NT WS gives you a power penalty of some watts, especially when you will overclock higher. Also the "Southbridge" which is defacto a single-chip chipset will add to the penalty. Of course the consumption will vary if you use other equipment. If workstation is an issue for you, needing SLI and PCI-X than you don't have much choice. When PCI-X is no use for you, choosing an other board is wise. While the difference between x8 and x16 is only a couple of frames, such boards are much cheaper. The issues with the VRM also is a reason not to purchase this board. We got in contact to ASUS and asked if this is just an BIOS-issue or a bad design, because we have seen such behaviour also on the newly P5K board. When ASUS provides an answer, we will update this article and let you know. Compared to the MSI P6N-SLI Platinum the price is too high. The ASUS P5NT WS is selling for about €195,-.